Chris was honoured to be requested a testimonial year by the Worcester Warriors Supporters Club and this was kindly granted by Worcester Warriors Club President, Cecil Duckworth and Chairman, Bill Bolsover. The committee, assembled to manage the Testimonial year, have put together a series of events to recognise the contribution Chris has made to the Warriors and the community to date. Chris has always had a brilliant relationship with Warriors supporters and the Worcestershire community and is grateful for all the support he has already received with his Testimonial Season as it looks to raise awareness and money for Acorns Children’s Hospice, Diabetes UK and the Grace Kelly Ladybird Trust. Worcester through and through, the full-back is a successful product of the Academy and is currently the longest serving 1st team player following his Premiership debut in 2007 against Bath Rugby. Chris has gone on to enjoy an outstanding career at Sixways, captaining the team between 2010 and 2012, helping the Club to two Championship promotions and becoming a double centurion in May 2018. Encouraged by his Mother, Helen, Chris was a talented all-round sportsman as a youngster and as the son of England cricket legend Graham Dilley, possessed huge talent with a cricket ball and occasionally with the bat. Chris was Head of School at Old Swinford Hospital and soon came to the attentions of the Warriors coaches with his obvious flair for rugby. He joined the Warriors Academy after leaving school, later representing England U19 that season. Chris went on to make his first-team debut against Bath Rugby in 2007. Chris’ importance to the Club grew every season during his early days at Sixways and by 2010 he was captaining the side – a role he held until 2012. Following injury, Chris stepped down as captain to concentrate on his own game and continued to be an indispensable member of the Warriors first-team. He missed just two Premiership games in the 2012/13 season and was an ever-present during the next. Chris’ performances during the 2013/14 campaign saw him shortlisted for the Premiership Player of the Season award amid huge interest from some of the top clubs in the country, who were keen to capture his signature. Chris showed his loyalty to the Club by remaining at Sixways and was rewarded with a call-up to the England squad for their tour to New Zealand in the summer of 2014. He made his England debut against the All Blacks at Eden Park and impressed for England later on the tour as he crossed the whitewash and assisted a try in the win over the Crusaders. Chris was then named man-of-the-match for England Saxons as they beat Ireland Wolfhounds in January 2015. Chris helped Warriors secure promotion from the Championship in 2015 and was an ever-present for his side during the 2015/16 Premiership season. He continues to be an invaluable member of the Warriors team and made his 200th appearance for the Club in his side’s final home game of the 2017/18 season against Harlequins. He has played over 130 Premiership games and was awarded a Testimonial Season after 11 stellar seasons in the Blue and Gold. Chris has a busy life away from rugby with his wife, Joanna and young children, Harla and Tristan. As one of only a handful of professional sportsmen with diabetes, he is also well-known for the work he does off the field. 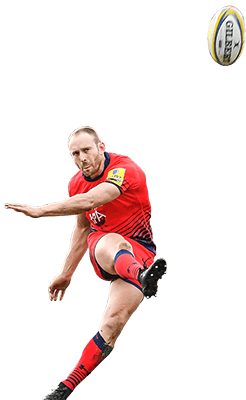 2017 saw the launch of his Chris Pennell’s Diabetes Rugby Academy for children with Type 1 Diabetes and he is also and active trustee for the Warriors Community Foundation. We have lots of events coming up throughout the year! Check back here to stay up to date!